More than half of tablet owners say they read news on their device every day. NEW YORK (CNNMoney) -- As the mobile tech revolution takes hold, the way in which we get our news is changing. More than a quarter of Internet-connected Americans now follow news on mobile devices such as smartphones, tablets and e-readers, according to the Pew Research Center's annual State of the News Media report, which was released on Monday. Here's the surprise: Those users track the news on a much more frequent and consistent basis than any other news consumers, including those surfing on PCs. 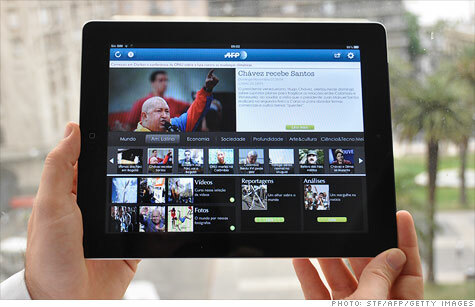 For instance, 53% of tablet owners read news on their device every day. Smartphone and tablet users visit more pages in a given sitting and return to news sites more often than those using computers, according to Pew Research's analysis, which draws on its own data as well as other organizations' recent studies. The PC is still the primary way we consume digital content, but that's about to change. Among smartphone owners, their primary news consumption device is a virtual tie between the PC and the smartphone. Interestingly, social media is not a big driver of news consumption for either PC or mobile device users. Just 9% of Americans told Pew Research that they follow Facebook or Twitter recommendations for news "very often." That compares with more than a third who "very often" go directly to news websites, and 32% who get news their news through search engines. Almost 30% rely heavily on some sort of news organizer site or app. As digital news gains steam, dead-tree news is the big loser. Newspaper readership fell 4% last year, according to Pew's estimates, while magazines stayed fairly flat. Network TV viewership rose 4.5%, while local and cable TV audiences grew by just 1%. But where audiences went, revenues didn't necessarily follow. Online sales rose by a meteoric 23% and cable revenue grew by 9%. But sales at network TV, magazines, local TV and newspapers all declined -- by 4%, 6%, 7% and 7% respectively. As a result, Pew predicts that more traditional news venues will begin enforcing paid digital subscriptions "as a matter of survival." The organization forecast that 100 more newspapers and magazines will soon charge customers for reading content online, adding to the estimated 150 companies that already charge for digital subscriptions today. "This also reflects a starker reality," Pew researchers Amy Mitchell and Tom Rosenstiel said in their written report. "Many newspapers have lost so much of their ad revenue -- more than half since 2006 industry-wide -- that without an infusion of digital subscription revenue, some may not survive."